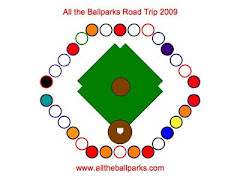 Now that the tentative 2009 schedules are out I have gone through them and come up with a plan for our All the Ballparks trip next summer. As of right now I have it planned that we see a game at every ballpark, but it is possible that some may get rained out, etc., so the possibility of substituting tours for games is still the fall back to see all the ballparks. July 17, 2009: Drive from Cartersville to D.C. Sounds like an awesome trip! Keep us updated throughout the winter....huge baseball fan from Buffalo....would love to do that someday!